Learn about fixed and recurring line items. You can specify which of your line items are “fixed” and which are “Recurring”in your estimates as well as when you save line items to your library. This gives you flexibility, as you may have some services or products that have a one-time fee and others that get charged over time. If you have both Fixed and Recurring items in your estimates, you’ll now notice 2 totals at the bottom of your estimate that represent both your fixed and recurring grand totals. Check it out! Line Items can also be updated in the library and imported in bulk as either Fixed or Recurring. Then as they are added to your estimate, both recurring and fixed totals will be calculated at the bottom of each estimate. 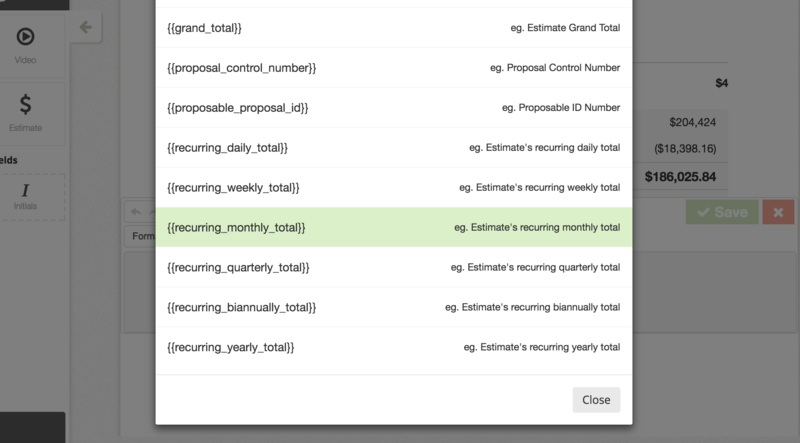 There are now new “Merge tags” for the various types of recurring totals, so you can now place both fixed and recurring totals throughout your proposal to reference these various estimate totals.